Garage doors might operate simply – go up, come down, and that might fool you into thinking that the mechanism that governs that simple action would be an easy fix if it goes bad. Not even close! Other than very simple tasks like changing remote batteries, and perhaps, lubricating a few moving parts, do not attempt any repair on your garage door just because you want to save a few bucks. In whatever you do, you must consider your safety and the safety of others first before anything else. Garage doors are very heavy. Don’t be fooled by the seeming ease at which they go up and down. The entire mechanism is designed in such a way that it operates smoothly, but make no mistake - that door weighs at least 150 pounds! Trying to fix your door by yourself can get you into serious trouble if anything goes wrong. It actually takes two or three people to properly fix a garage door. There are records of tragic incidents that have occurred as a result of some dude somewhere trying to be too smart for his own good. It’s simple: if something goes wrong with your door call an expert ASAP, you’ll be doing yourself and family a big favor. Okay, how about a few simple questions to get you started. Ready? What is a wall bracket? What kind of spring does your door use, torsion or extension or both? What kind of rollers does your door use? If you can’t provide the correct answer to these questions you are better off ringing a professional. A garage door is dangerous enough, but attempting repairs with next to zero knowledge or skill is doubly dangerous. Experts are called experts because they are trained for the job and have tackled the issue you are facing a thousand times. This puts them in a better position to fix the issue. Many garage doors come with a few benefits from the company when purchased. Guarantees, warranties, free service parts, etc. are the most common ones. 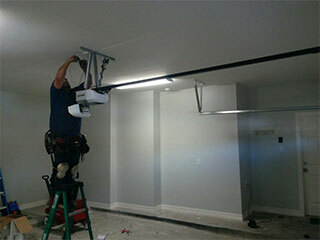 Repair companies also provide these benefits on your replaced garage door components. So if you go messing around with the door you cannot claim or provide warranty for the components by yourself. Why not sit back, relax and let the repair company do their job while you enjoy part and labor warranty.